A decoration of sorts. First thing I saw at the facility. He had spent hours rehearsing conversations in his head before the journey here, carefully practicing the pronunciation and making an effort to pack plainer, dully-colored clothes. More than anything, Tyhjä hated feeling uncomfortable in the presence of others, but nevertheless it seemed he was constantly embarrassing himself here. 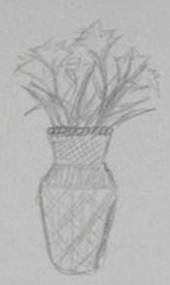 Just now, he had been so relieved to see a decorative item inside the building that he had blurted with reckless abandon something inane about how nice it was even though it was just a vase of flowers, and probably imitation flowers, at that. His guide had looked at him oddly, thanked him politely, and continued on towards whatever interesting specimen Tyhjä had been assigned to take a look at. All the while, Tyhjä wished he could just melt into the floor and disappear. It was enough that everyone looked and acted so different; still he stood out so much that sometimes the people here would turn away, would whisper to themselves about him, his companions, their tasks, their work. Antarctica. Empire. Emissaries. Secrets. Antarctica. He could both hear and understand them, but he wasn’t sure if he should let them know. This is “408”. It’s confusing. I wonder what other things it can turn into. More later. Tyhjä squinted at the green, no, gray mass of butterflies, and attempted once more to draw a rough outline of their wings. 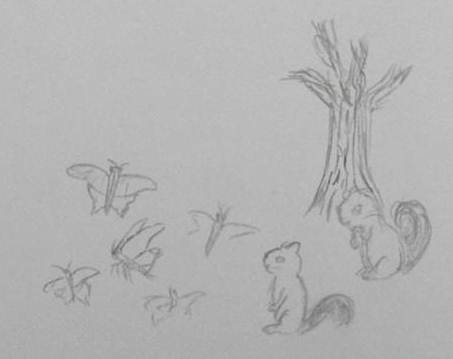 He looked at his notebook quickly to make sure he wouldn’t run out of space, and when he looked back there was some sort of furry gray creature sitting in the midst of the fluttering insects. He blinked, then tried sketching it as well. It was eating something vaguely oval-shaped. The door to the aviary opened, and Tyhjä turned to see who had entered. It was a female human, holding a large container of a clear liquid. The person looked at him, raised one hand and moved it side to side in greeting, and proceeded to pour the liquid into waiting receptacles, which were soon swarmed by shimmering wings. Looking back towards the gray creatures, Tyhjä realized that a tree had somehow sprouted in the middle of the aviary without him noticing. Confused, he instinctively began drawing the outline of the trunk as the human finished filling the feeding containers. “…I see. Where can I find this doctor?” Tyhjä began packing up his drawing materials as the woman opened the door. The researcher led Tyhjä through a confusing series of hallways (they all looked alike, were all lit alike, and even almost all sounded alike, it was disorienting) to a door that seemed quite like the other hundred or so he must have passed. “He’s running some experiments there, feel free to wait inside, just make sure you don’t touch anything.” She smiled, patted Tyhjä on the shoulder, and walked off. So many different glass objects. Tyhjä flinched slightly, and abandoned his drawing of a series of strange glass objects, some containing oddly-colored liquids. His eyes met those of a man wearing a long white coat and an expression that seemed to be a mix of curiosity and surprise. “Antarctica, right? 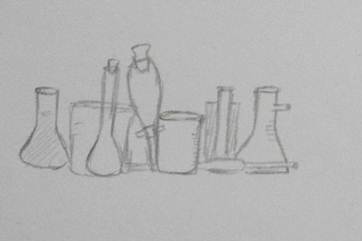 My sister mentioned you.” Kiryu busied himself carrying away the tray of glassware Tyhjä had been drawing. “Sister?” Tyhjä wondered out loud. “She’s seen you a few times today, yes.” Kiryu dragged a chair with wheels on its legs from somewhere and sat on it, looking speculatively at Tyhjä. The artist avoided the doctor’s gaze, staring at the too clean, too plain floor. They call this “348”. It is a good cook. “Here we are. I hope you don’t mind eating in a testing room? I’m afraid it’s the only available place, at the moment.” Kiryu led Tyhjä to a small, bare room, furnished with only a table and chair, both made of some stark white material. The doctor was carrying a sizeable bowl, empty, and a metal utensil, a spoon, Tyhjä noted. “I don’t mind. I prefer quiet places.” Tyhjä stated, glancing around. Kiryu chuckled, then his eyes went wide. “Spider!” he shouted, and stomped on Tyhjä’s foot. Tyhjä muffled a cry of pain and staggered backwards slightly. Had he said something wrong? Was that some sort of obscure human joke? The doctor had placed the bowl and spoon on the table. “Good, good… well, there you go! Just leave these in the room when you’re finished. Oh, and if you don’t mind, I’d appreciate knowing what sort of meal it prepared for you… I’ll be waiting outside.” Kiryu smiled, then closed the door. Tyhjä was perplexed. How could he eat from an empty bowl? He walked towards the table, then took a few steps back. The bowl wasn’t empty. It was filled with a clear, golden broth that smelled of sea salt and starchy roots, of Antarctic fish and Antarctic spices. Tyhjä sat down, picked up the spoon, prodded the soup with it. Real. Definitely real. Even though the only one who could have possibly made this soup was far, far away, was the one who sent Tyhjä and his sister off alone to train their skills when they were barely grown. How did it…? Wary though he was of such an odd miracle occurring, Tyhjä couldn’t help but feel calmed by the nostalgic scent he remembered from his early childhood. It brought back countless memories. 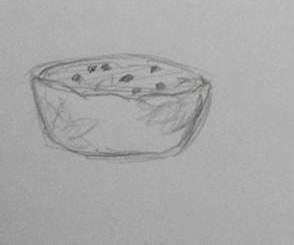 He hesitated, took out his notebook, and drew a quick outline of the bowl and the soup, then finished the entire bowl in a few gulps, spoon completely forgotten. Alai says this looks weird. She told me to write that. Tyhjä finally found a quiet place to sit by himself, a little courtyard in the center of a building used for animal research, so he was told. There were benches and a few trees there, and moreover, several birds that came and went. With a sigh of relief, Tyhjä withdrew his notebook and a writing stylus from the satchel he carried with him. Opening to a new page, he followed the path of a bird in flight, beginning to draw as he watched. To be truthful, the creatures were almost too small to be called birds by Imperial standards. It was pleasant, though. Such a tiny little being was a welcome change of subject from the fierce, winged predators with cruelly hooked talons Tyhjä was accustomed to seeing. It was fascinating to watch these different birds fly, as well as comforting to know that the little chirping things would not attempt to attack him and rip out his innards should he get too close. Tyhjä suddenly felt a slight weight pressing on his head, and he realized that one of the little dark brown birds had landed on him. 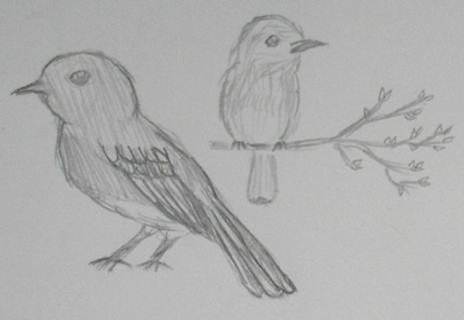 Tyhjä resumed sketching, and the bird resumed sitting on his shaggy hair, occasionally chirping out a query to its friends sitting on the trees. Tyhjä allowed himself a small smile. The birds at home never sang. Suddenly the bird flew off. Tyhjä frowned, watching it arc through the air and into the sky. He wondered if something had startled it. At the sound of footsteps, Tyhjä looked over his shoulder and nearly fell off his bench. Someone standing right next to him was looking intently at him, no, his notebook, and that someone was dressed in such bright colors that Tyhjä could’ve sworn his eyes started burning. He had seen her before, he thought dazedly. The one who liked asking questions. He blinked a few times, attempting to edge away slightly without seeming rude, and he noticed his sister sheepishly leaning against a nearby wall. “…Sister. Who is this?” Tyhjä managed, slightly shaken. “What’s that?” Alai pointed to the sketch he had been working on. “What do you think of this place so far?” Alai smiled, setting down the armful of books she was carrying. “I like it well enough, thank you.” Tyhjä stood up, intending to find another (quieter) place to stay. “Alai, Sister, if you’ll pardon my leaving, I’d like to find some different birds to observe.” He inclined his head slightly to the two of them, and then padded away towards the door leading back into the facility. “Tyhjä, you’ll tell me more about these birds later, won’t you?” Alai’s cheerful voice followed Tyhjä as he made his escape. Empress help him, he needed to lie down.